Travel directions can be found in the Barclays Center transportation guide. Take the 2, 3, 4, 5, B, C, D, G, N, Q, or R to the Atlantic Avenue - Barclays Center station. The B25, B26, B38, B41, B45, B52, B63, B65, B67, B69, and B103 all stop at or near Barclays Center. Take the LIRR to the Atlantic Terminal station in Brooklyn. Take the Brooklyn Bridge to Tillary Street, continue onto Adams Street and take a left on Atlantic Avenue. Arena should be visible on the right. You can also take the Manhattan Bridge, and continue onto Flatbush Avenue Extension. Then continue onto Flatbush Avenue, and turn right on 4th Avenue. Take the first left onto Atlantic Avenue and arena should be visible on the right. Take the I-278/Brooklyn-Queens Expressway to Exit 29B and merge onto Tillary Street. Turn left onto Flatbush Avenue Extensions, and continue onto Flatbush Avenue. Turn right onto 4th Avenue, and arena should be visible on the right. Get up to speed with our new drop-off and pickup locations. A number of convenient parking garages are located in close proximity to Barclays Center. 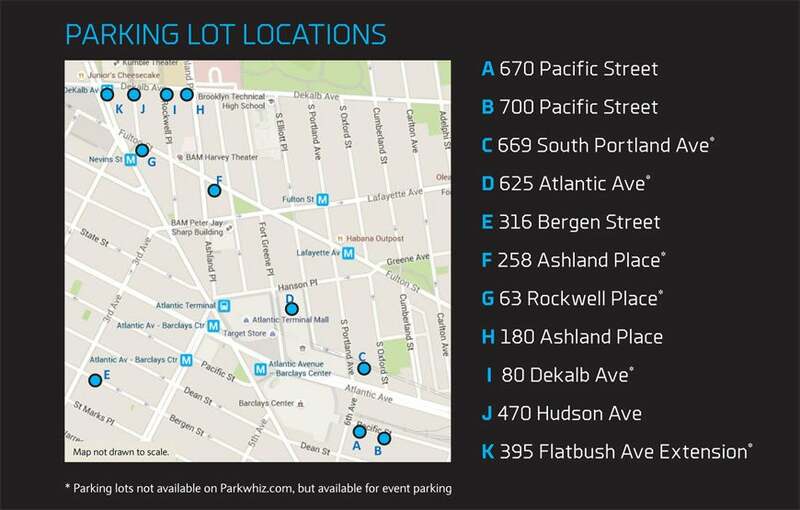 Refer to Barclays Center parking or parking lot locations near Barclays Center.